KPFA Weekend News Host Cameron Jones: On Friday, two independent observers reported that they had seen workers for the SF Neighbor Alliance in San Francisco’s Chinatown actually marking voters’ absentee ballots for their San Francisco mayoral candidate, Interim Mayor Ed Lee. The workers had set up an unofficial voting booth by erecting a portable canopy bearing Ed Lee campaign signs over ironing boards. The SF Neighbor Alliance includes many of the same people who worked on the controversial “Run Ed Run” campaign to get Lee into the mayor’s race, even though he promised not to run, before the San Francisco Board of Supervisors approved his appointment by outgoing Mayor Gavin Newsom in January. KPFA’s Ann Garrison has the story. KPFA/Ann Garrison: The San Francisco Chronicle reported today that two independent observers reported that workers from the SF Neighbor Alliance, an independent expenditure committee working to elect Interim Mayor Ed Lee, were actually filling in ballots for voters in Chinatown on Friday. A third witness, Adam Keigwin, a staffer with state Sen. Leland Yee’s rival mayoral campaign, said that he saw the workers take voters’ absentee ballots, place stencils over them so that they could only mark the ballot for Lee, then seal the ballot in the official envelope and drop it in a bag with no other picks for mayor marked. Voters have the chance to mark ballots for their first, second and third choices in San Francisco’s instant runoff voting. Their second and third choices are counted if and when their first and then their second choices are eliminated. 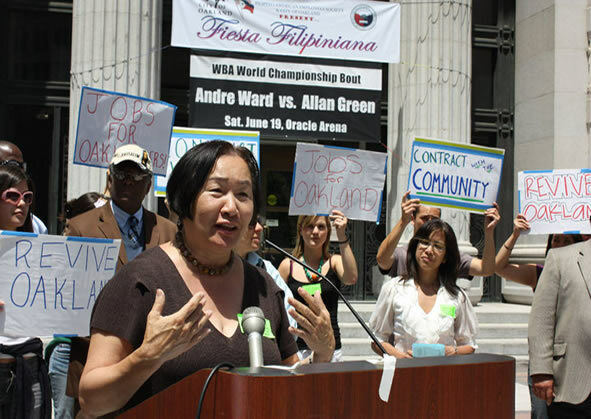 In 2010, Jean Quan won the Oakland mayoral election thanks to instant runoff voting, though former state Sen. Don Perata won the most votes in the first round, as Interim Mayor Lee is expected to. Adam Keigwin: Well, yesterday, what I witnessed was not only deeply concerning to Sen. Yee and the other campaigns for mayor but deeply concerning to, probably, most San Franciscans. There were individuals on the sidewalk in Chinatown who were literally putting a stencil over the ballot, and the only possibility that an individual could mark was Ed Lee for mayor. That was all they would do; that was the only race they would vote on, and then they’d seal the ballot and put it in bags behind them. What we’re hearing out in the field is that individuals are filling out ballots for elderly Chinese. This is a possible massive voter fraud. A fourth witness, affiliated with anther rival mayoral campaign, shot video later in the day on Friday which shows workers with blue Ed Lee shirts who appear to be holding a small, clear piece of plastic over different spots on the ballot but not actually marking the ballot for the voter. John Arntz, the head of San Francisco’s election department, referred the allegations and video to Interim District Attorney George Gascón’s office for investigation and requested civil legal advice. Gascón is already investigating allegations that GO Lorrie’s airport van company laundered donations to Lee’s campaign through employees after a City ruling favorable to GO Lorrie’s Airport Shuttle with regard to airport parking. • According to Yee worker Andy Li, at the federally-funded senior housing complex on 441 Ellis St., residents were invited to the common room for help on how to fill out their absentee ballots but were first treated to a projector video of commercials and videos of Ed Lee. 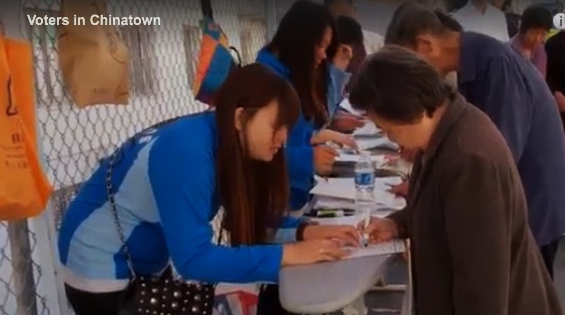 Residents then were “assisted” by Ed Lee volunteers in filling out their absentee ballots. • In clear violation of election law, Bayview volunteers told Yee’s Field Director Anthony Thomas that they were paid $150 cash to walk precincts and do other voter contact in the neighborhood. • In a number of Filipino housing complexes, absentee ballots still have not arrived at residents’ homes, raising concerns that they may have been removed by apartment management. Yee is widely considered to be heavily favored in the Filipino American community. • A number of Ed Lee volunteers have attested that they were assigned to work on both Ed Lee’s official mayoral campaign as well as his various independent expenditure campaigns, raising serious issues of illegal coordination between the campaigns [meaning, between the official Ed Lee for mayor campaign and the “independent expenditure committee,” which is, by law, not supposed to communicate or strategize with the real deal]. We write to bring to your attention news reports and accompanying videos that may indicate violations of federal and state laws intended to protect voting rights and to assure the integrity of our electoral process. In light of published accounts in the San Francisco Chronicle and Bay Citizen about electioneering activities by the SF Neighbor Alliance for Ed Lee for Mayor 2011, we request that your respective offices immediately detail federal observers and state election monitors for San Francisco’s mayoral election, which is currently underway. • Testimony by independent witnesses that SF Neighbor Alliance for Ed Lee for Mayor 2011 staff were completing ballots for voters. • Testimony and video evidence that SF Neighbor Alliance for Ed Lee for Mayor 2011 staff employed plastic stencils and handled absentee ballots in such a manner as to prevent voters from marking their ballots for other mayoral candidates. 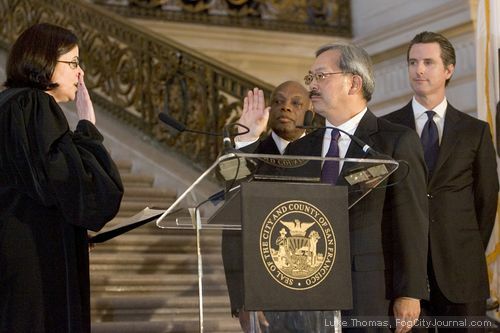 • Testimony that SF Neighbor Alliance for Ed Lee for Mayor 2011 staff, as apparently ineligible third parties, received and collected into plastic bags voted ballots from voters, taking ballots into their possession. • Testimony and video evidence that SF Neighbor Alliance for Ed Lee for Mayor 2011 staff interfered with the secrecy of voting. If true, these allegations and other conduct may violate the U.S. Voting Rights Act of 1965 and California Election Code provisions pertaining to electioneering, corruption of voting, the Voter Bill of Rights and other laws. Given their gravity, the importance of protecting voting rights, and assuring voter confidence in our electoral processes, we believe federal observers and election monitors are immediately warranted, and that further investigation by your respective offices would be well advised. Well, some of us are still sentimental about voting rights, even after all these years. But there are at least two more reasons to care: public power and municipal banking – in the public interest, for the 99 percent, not the interest of the 1 percent so accustomed to running the City and County of San Francisco like a family business. Last week the SF Bay View reported on the municipal bank proposal finally emerging in the new political climate defined by backlash against the bank bailout as much as anything else. Six of the seven candidates who signed this letter are on record in support of both public power and a municipal bank. Michela Alioto-Pier is not, but she seems unlikely to be elected. The other six who signed all confirmed that they support both public power and a municipal bank, as did Green Party mayoral candidate Terry Baum, at the September San Francisco Bay Guardian candidate forum. Interim Mayor Ed Lee failed to appear at the forum, as he has at so many others and as incumbents so often do, even appointed incumbents. On Thursday, Oct. 20, 2011, KPFA and the SF Bay View called Interim Mayor Ed Lee’s press office to ask whether he supported a municipal bank and the press office promised an answer as soon as possible. However, as of Oct. 24, the office still had not responded, and Interim Mayor Ed Lee still appeared to be the candidate of B of A and PG&E. The Bank of America handles most of the City’s banking and bond underwriting, and PG&E still has a virtual monopoly on its gas and electricity markets. San Francisco writer Ann Garrison writes for the San Francisco Bay View, Global Research, Colored Opinions, Black Star News, the Newsline EA (East Africa) and her own blog, Ann Garrison, and produces for AfrobeatRadio on WBAI-NYC, Weekend News on KPFA and her own YouTube Channel, AnnieGetYourGang. She can be reached at ann@afrobeatradio.com.